I have been working on a new project with C.Q. Scafidi for a little while now. We had the seed of the idea back when we co-wrote the last story in "The Outlaw Unchained" series. We will be releasing "Volume 1 - Visions" on 1/15. It will be available on Amazon Kindle, B&N Nook, Kobo, Apple, Google Play and a number of other retailers. You can read the first 2 Chapters right now by either clicking on the link below,clicking on the image on the sidebar of my blog, or by clicking on the word "The Posse" on Header at the top of the blog. If you do take the time to read it,please leave a comment and tell us what you think.We would love your feedback. Wait,maybe I should delete that. No, I am going to let that dangle there. 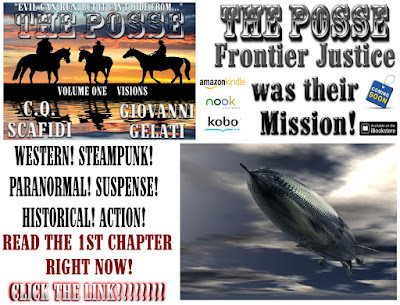 Check back often, there will be much more on "The Posse" and all the other projects I will be starting.